This is the second in a three-part series about travel in North Korea. Road travel anywhere outside Pyongyang is extremely unpleasant. 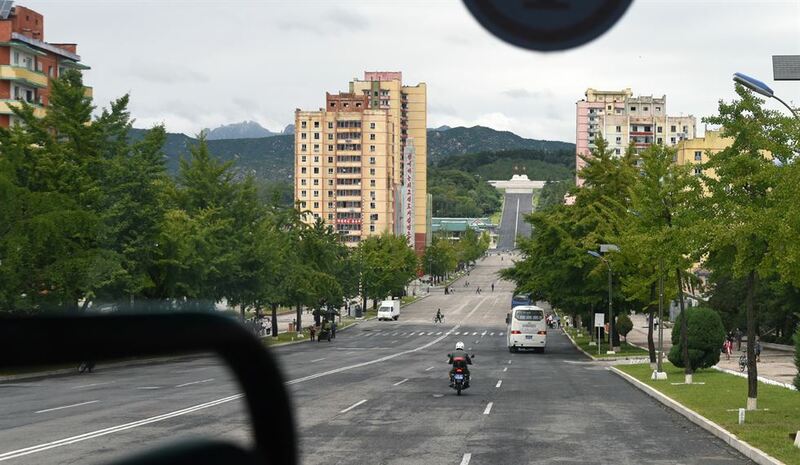 Google says the 172.3km Pyongyang-Kaesong Highway is a 102-minute trip, but the actual time is closer to two and a half hours due to the patchy roads that hinder travel speeds. Despite this, leaving the capital at least once on a visit to North Korea is worth it. Pyongyang is a showcase city, but Kaesong better represents North Korean urban life. It served as the capital of the 918-1392 Goryeo Kingdom and still has numerous historic attractions. After division of the peninsula, Kaesong was part of the South, but changed hands during the 1950-53 Korean War. Yet, most people in the South would only think of the Gaeseong Industrial Complex (GIC, spelled with a G to reflect the South's Revised Romanization style), located about 5km outside the populated area. Kaesong is a beautiful and sunny, yet gritty and textured metropolis, among the North's top 10 by population with around 200,000 people. It's suffused with broad apartment buildings of many bright colors and porous back alleys offering a glimpse into real North Korean city living. Colors are stronger here than my 2010 visit, suggesting a citywide major beautification project since then. Tongil Street cuts north-south through the city bisecting a valley, so when you enter Kaesong from the south, the road curves down and then up again to statues of former leaders Kim Il-sung and Kim Jong-il. The city is a pleasing combination of medium-rise apartments and older houses, what we in the South would call hanok. But that word is foreign to North Koreans, who speak joseonmal rather than hangukmal and wear joseon-ot instead of hanbok. Kaesong's streets are crawling with life. You can see people of all ages riding bikes everywhere, assembled together or just hanging out with no clear objective. It's different from Pyongyang where the streets feel emptier and everyone has somewhere to go. On a short bus ride through Kaesong, I witnessed people setting up stands or traveling around to sell stuff, and saw one kid offering shoe repairs. Soon our bus pulled into a parking lot located between two mirror-opposite gift shops made in a traditional Korean style. We were at the entrance to the Kaesong Koryo Museum, which people in the South might better understand by its original name: Sungkyunkwan. This institute of higher education, originally named Gukjagam, traces back to 992. With the changing of dynasties in the 1390s, the capital moved south to Seoul and Sungkyunkwan moved too. The Koryo Sungkyunkwan buildings remained until their destruction in the 1592-98 Imjin War. Many of the reconstructions were said to date back to 1602. Just like in the South, some of the trees were even older. I'm one of only two members I know of an exclusive club of people who've been to all three Sungkyunkwan campuses: in Kaesong, Seoul and Suwon. After my 2010 visit, I worked for Sungkyunkwan University (SKKU) in Seoul, serving as the de facto English-language tour guide for the old campus. 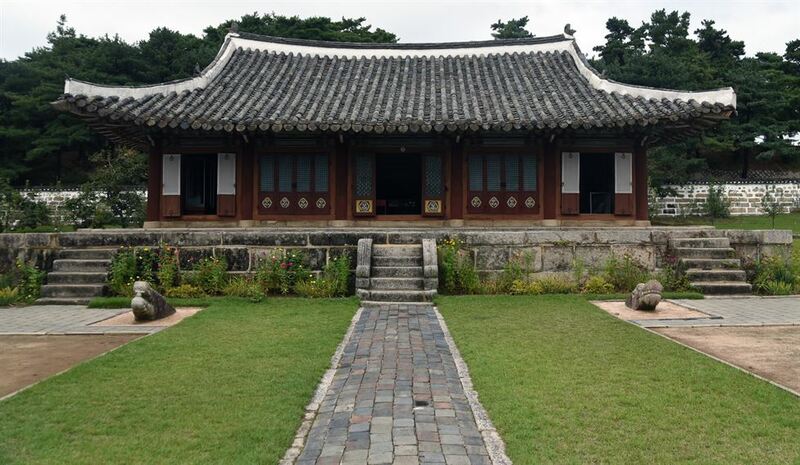 Both Sungkyunkwan traditional campuses are identical in layout, centered around two separate rectangular yards arranged like a geomantic circuit board, one for academics and one for worship. Gukjagam was a cultural import from China's Confucianist Song Dynasty, its curriculum focused on the Confucian classics necessary for the complicated civil service exam. However, the museum, opened in 1987, highlights the prerevolutionary bad old days and emphasizes the Buddhist relics on view at this historic Confucian site. Nevertheless, a stone plaque boasts the site was added to UNESCO's World Heritage list in Juche 102 (2013), an accomplishment still out of reach of our Sungkyunkwan. To the west of Koryo Sungkyunkwan was a massive palatial building my guide said was Sungkyunkwan University of Light Industry. Wikimapia labels it as Koryo Sungkyunkwan Academy, and I can't guess its affiliation to the university, whose main campus is located about a kilometer south. Yes, North Korea has its own SKKU, and it had ties with the South's during the Sunshine Era. Our SKKU claims to be the oldest in Asia, but theirs is a full four centuries older. Imagine that, if you own any SKKU paraphernalia, after reunification you might have to upgrade your "Since 1398" gear for "Since 992." Next, we had a great lunch at a Kaesong restaurant, made possible by tour organizer Paektu Cultural Exchange. 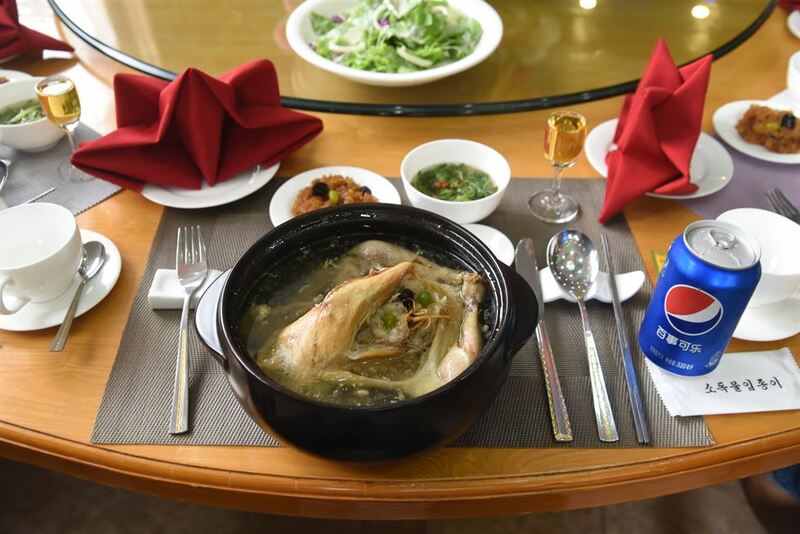 They served insam dakgom (ginseng chicken stew, indistinguishable from South Korean samgyetang), and I found actual Chinese-labeled Pepsi available. Ginseng is a staple of the region. Most of our group agreed it was our best meal so far. As we left, I noticed a grand traditional house through the trees behind the restaurant. My guide told me it was the home of Jeong Mong-ju, a Goryeo loyalist who refused to recognize the rise of Joseon and put to death. Jeong is one of Korea's 18 Men of Virtue, and a biannual ritual at Seoul's Sungkyunkwan still honors him every year. Kaesong's fate is to serve as a gateway between the Koreas. The city, located between Seoul and Pyongyang on Korea's oldest train line, the Gyeongui Line, has incredible cultural value. And as the site of the GIC and SKKU, it will likely serve to distribute the wealth, vocational skills and cultural savvy needed to reconnect the Korean Peninsula. In Kaesong, the inherent value in reunification for both Koreas will shine brightly.